Alapaha Blue Blood Bulldog Characteristics: The Trustworthy and Faithful Alapaha Blue Blood Bulldog is a breed of large dog classified as a member of the Rare Dog Breed. The Alapaha Blue Blood Bulldog, is characterized by its robust, hardy appearance with a broad chest, prominent muzzle and square head with a keen, attentive expression. This "plantation dog" exhibits the combination of characteristics associated with the Old English Bulldog and the Catahoula Leopard Dog. Other characteristics include medium sized, various colored eyes; high set, V-shaped, folded ears; a long tail, tapering to a point and a powerful, determined gait. The temperament of the Alapaha Blue Blood Bulldog can be described as Loyal, Dependable, obedient. The coat type of the Alapaha Blue Blood Bulldog is described as very short, thick coat in assorted colors. Due to its characteristics and qualities, the Alapaha Blue Blood Bulldog demonstrated the desired traits of a Watch dog, Stock Dog and Catch dog and is often referred to by its nick name the "Otto Dog". The origin of the Alapaha Blue Blood Bulldog breed was in United States where it was developed in the 1800's. Alapaha Blue Blood Bulldog Breed Group and Dog Type - Rare Dog Breed: The Alapaha Blue Blood Bulldog is one of the many breeds of dogs that belong to the Rare Dog Breed. Other names for the Alapaha Blue Blood Bulldog: The Alapaha Blue Blood Bulldog is known by the nickname of the "Otto Dog". Other names for this breed of dog include the Otto Dog, Mountain Bulldog, Old Southern White, Alf and the Alf Bulldog. 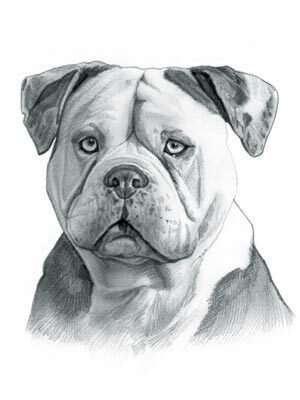 Origin of the name 'Alapaha Blue Blood Bulldog': The name "Alapaha" reflects the place the dog was originally bred in Alapaha, a town in Berrien County, Georgia, alongside the Alapaha River. The term "Blue Blood" is a play on the old belief that aristocratic blood was blue. The origin of the word 'Bulldog' is derived from its original use as a 'bull baiter'. Bull baiting was a contest in which trained bulldogs attacked tethered bulls. Alapaha Blue Blood Bulldog History and Origin: The country of origin of the Alapaha Blue Blood Bulldog breed was in the Southern United States during the 1800's. Its ancestors were the Olde English Bulldogs and mastiff breeds that were brought to America by the early colonists and settlers. The Bulldogs and mastiffs were the forebears of the 'Plantation Dogs' in the colonial era in the Deep South who were used as guard dogs and hunting dogs. Many of these dogs were notoriously trained as Catch Dogs and used by the patrollers to hunt and follow the tracks of fugitive slaves. Other ancestors were the Mountain Bulldogs, used as varmint catchers and stock dogs, which were cross breeds of Bernese Mountain dogs and Bulldogs. The Alapaha Blue Blood Bulldog breeding program was started in Rebecca, Georgia during the late 1800's by a man called Warren "Papa" Buck Lane. The first of the line was bred from the Mountain Bulldogs and Plantation dogs. Warren "Papa" Buck Lane named the first of his dogs "Otto", hence their nickname of 'Otto Dogs'. His granddaughter Lana Lou Lane later began to preserve the descendents of her grandfather's rare Otto Dogs under the name Alapaha Blue Blood Bulldog. Alapaha Blue Blood Bulldog Modern History: The modern history of the Alapaha Blue Blood Bulldog moved on and the breed is now used as a Guardian, protector and family companion. Alapaha Blue Blood Bulldog Height: The Alapaha Blue Blood Bulldog is classified as a large sized dog. The height to the shoulder of a male dog is 18 to 24 inches. The height to the shoulder of a female dog is 48-66 cm. Alapaha Blue Blood Bulldog Weight: Not surprisingly for a large sized dog, the weight of an Alapaha Blue Blood Bulldog male dog is 55 to 90 pounds. The weight of the smaller female dog is 25-30 kg. Alapaha Blue Blood Bulldog Coat Type: The coat type is described as very short, thick coat. Alapaha Blue Blood Bulldog Coat Colors: The colors of the Alapaha Blue Blood Bulldog dog breed are distinct due to the merle (mottled patches of color) on their blue, red and brown coats. N.B. The term "Red" refers to reddish shades of orange, brown, and tan colors. The word "Blue" is used to describe a cool-toned, metallic gray color. Alapaha Blue Blood Bulldog - LOW Grooming Needs: The grooming requirements of the Alapaha Blue Blood Bulldog is fairly minimal on their extremely short coat, one casual, grooming session per week is generally enough to maintain a healthy coat and reduce the risk of skin infections. Alapaha Blue Blood Bulldogs Grooming Requirements should include bathing the dog on a monthly basis and making regular inspections of the nails, teeth, eyes and ears. Alapaha Blue Blood Bulldog Litter Size: The litter size of this dog breed ranges from 4-8 puppies. Alapaha Blue Blood Bulldog puppies for sale can be obtained reputable breeders and from rescue centers. The cost of Alapaha Blue Blood Bulldog puppies varies depending on location, pedigree history and the dog breeder. Alapaha Blue Blood Bulldog Temperament and personality: The temperament and personality of this popular dog breed is described as Trustworthy, Loyal, Dependable, Obedient and Faithful. Other personality and temperament traits include attentiveness and alertness. Alapaha Blue Blood Bulldog Exercise Requirements - HIGH Exercise Requirements: The exercise requirements of this breed of dog is high. The Alapaha Blue Blood Bulldog requires regular daily exercise consisting of approximately one to two hours each day. This large, powerful dog has a vigorous, determined gait with strides of a moderate length and requires a brisk walking speed or jogging by the owner to meet the dogs exercise requirements. Alapaha Blue Blood Bulldog Diet: A fully grown Alapaha Blue should be fed twice a day. A diet consisting of a premium dog food should be balanced with fresh food eaten by the family. Meat should be thoroughly cooked and de-boned, mixed with soft fruits and vegetables such as peas, carrots, peas, diced cooked potatoes, yams and rice. Home cooked food can be supplemented with dry kibble (a ground meal shaped into pellets, especially for pet food). Alapaha Blue Blood Bulldog Health Problems: Potential health problems of the Alapaha Blue Blood Bulldog breed include Hip dysplasia, deafness, entropion. Resolving health problems can prove to be expensive and it is always wise to obtain pet insurance or dog health insurance when buying a dog. Is the Alapaha Blue Blood Bulldog breed said to be Hypoallergenic? Answer: No. Alapaha Blue Blood Bulldog Lifespan: The life expectancy of dogs vary according to the size, breed of dog and any serious health problems. The typical lifespan of the Alapaha Blue Blood Bulldog breed is 11 to 12 years. Alapaha Blue Blood Bulldog Male Dog Names: Male Dog names are most often chosen to reflect favorite names of the owner or the strength, size, coloring and country of origin of the Alapaha Blue Blood Bulldog breed. To give you some inspiration regarding good male Alapaha Blue Blood Bulldog names our small selection might be of help with naming boy dogs. Our top male dog names are: Ripley *** Murphy *** Spark *** Riot *** Scout *** Strider *** Shadow *** Taylor *** Trooper *** Whip *** Evie. Alapaha Blue Blood Bulldog Female Dog Names: Female Dog names tend to be softer, prettier and reflect the temperament of the girl dog. Our top choice of good female Alapaha Blue Blood Bulldog names are Sophie *** Latte *** Spirit *** Pepper *** Molly *** Lilly *** Kyra *** Frankie *** Jenna *** Daisy *** CiCi.